As a young girl, I spent much of my childhood by the shore. There were many warm days spent on the sand and summer nights on the pier, a place of wonder and adventures. It was where my sister and I eagerly hoisted up our nets to see if the chicken we had laced up lured in a few crabs. They’re quick on their feet, those little critters. In between catching fish on the pier, dad showed us how to catch those critters before our hard work scampered back into the water. We learned quick. It was a place where I gingerly avoided certain spots of squeaky, creaky boards, a place my sister and I would dare each other to run through. A place where the smell of salty air was refreshing, even though it turned my curls this way and that. The best part of course, was taking home our catch and savoring the freshness and magic of it all. I had no part in the magic. That was all dad’s doing in the kitchen. This is one of my favorite seafood recipes because it looks incredibly fancy yet super easy to make. I got these fresh cultured mussels at the nearby Whole Foods at $8.00 for 2 pounds. Holy moly, that’s like at least 20 mussels. Definitely enough for date night at home. Cleaning and prepping mussels is the most important thing. You want to make sure these guys are squeaky clean, so here’s the how-to. 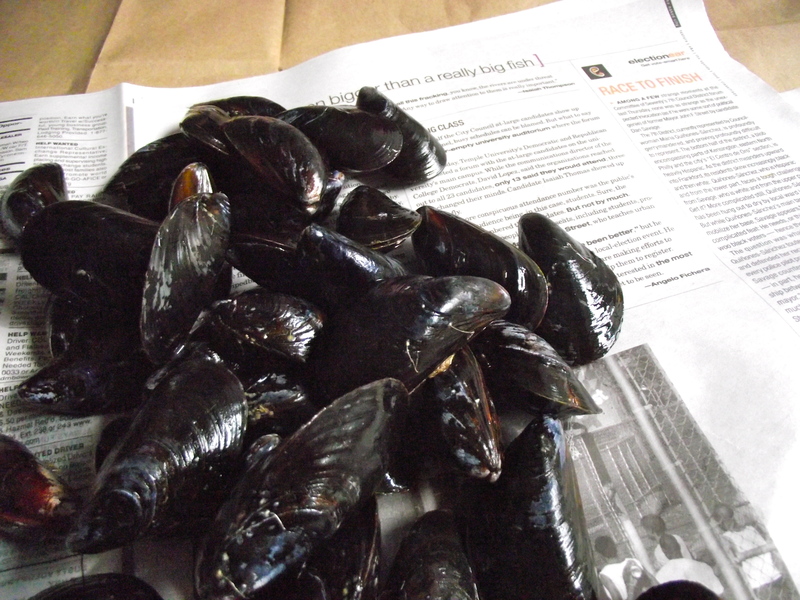 Step 1.Put the mussels in a large bowl with 2 quarts of water and 1/3 cup flour. Allow to soak for 30 minutes. What’s up with the flour you ask? I’ve read that it helps to dislodge any sand that may be trapped inside and the mussels eat up the flour, making them more succulent and juicy. Step 2. Throw away any mussels that float to the top. After 30 minutes, drain and rinse thoroughly. Remove the “beard” from the outer edges if present. Take a brush to scrub the outer shells under running water if they are really dirty. Throw away any mussels whose shells aren’t tightly shut. Place in a separate bowl and set aside. 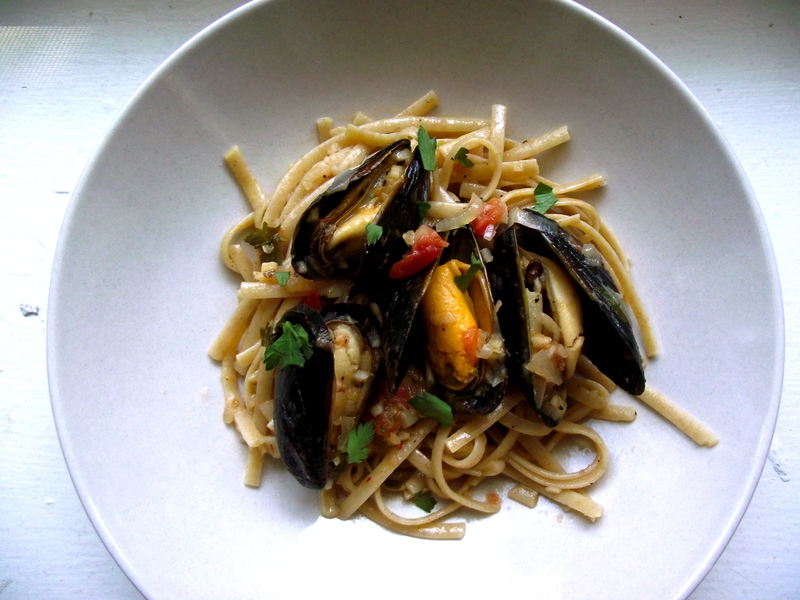 *I usually cook the pasta while the mussels soak. Follow instructions on the box, then set aside. 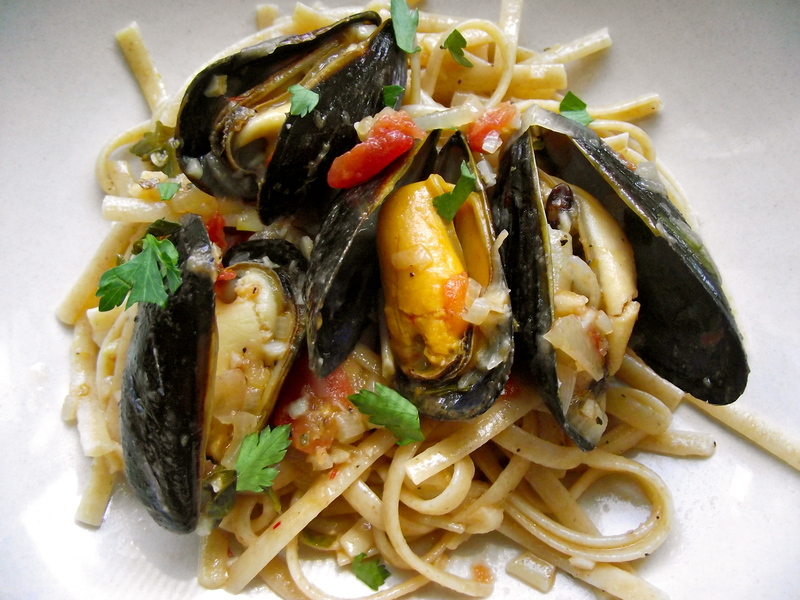 *recipe adapted from Ina Garten’s Mussels in White Wine, Barefoot in Paris via FoodNetwork. Step 1. 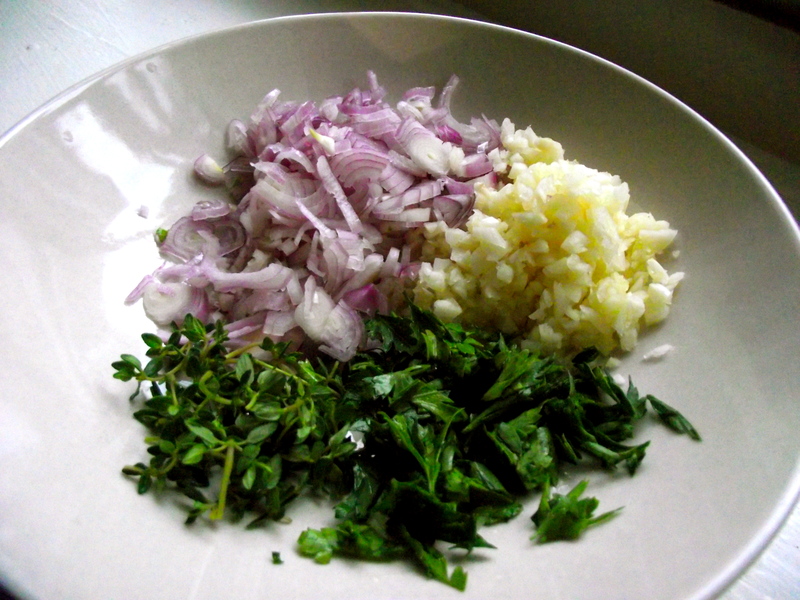 Chop the shallots, garlic, thyme and parsley. Uncork your wine, measure out a cup, then pour yourself a glass. Drink. Step 2. Add the olive oil to the pan and heat on medium. When oil is hot, add the butter. Let it melt then add the shallots. 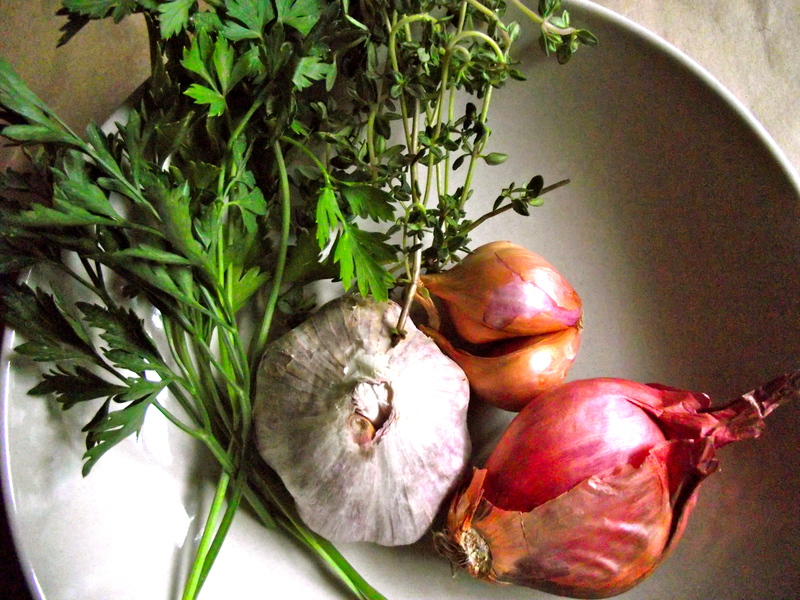 Gotta give the shallots a head start then add the garlic about 1 minute in. Sautee the garlic 2-3 minutes but don’t burn. Step 3. Add the bruchetta, wine, saffron, parsley, thyme, salt (just a touch) and pepper. Then feel your mouth start to water. Bring the mixture to a boil. Step 4. When boiling, add the mussels, stir well, bring the heat down to medium, then cover the pan. 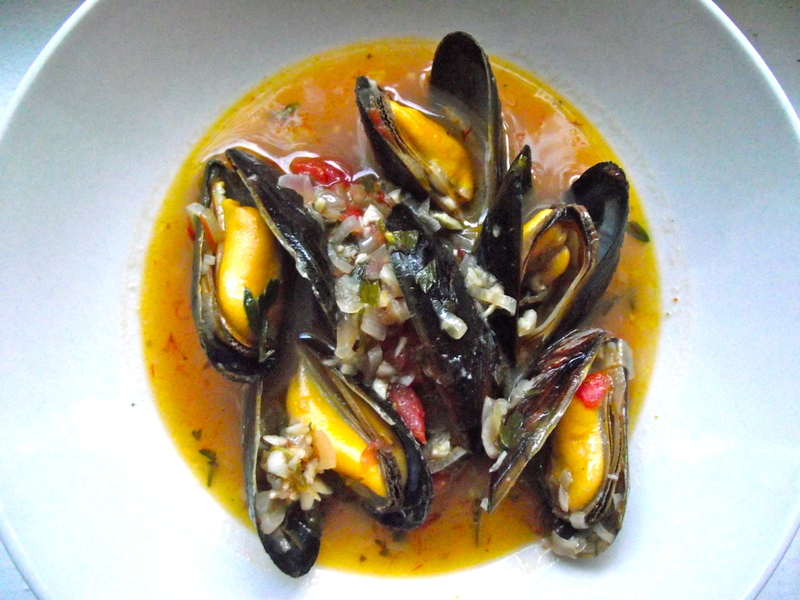 Allow to cook for 10 minutes, until mussels open (Yea, that’s it !). Throw away any mussels that are not open. Stir them in the sauce one more time, and taste the sauce. Add more salt if needed. Turn off the heat, transfer to a large bowl and enjoy! Why the Bruchetta? Traditionally, this recipe calls for canned tomatoes, but I find that using the bruchetta makes it a bit more special. 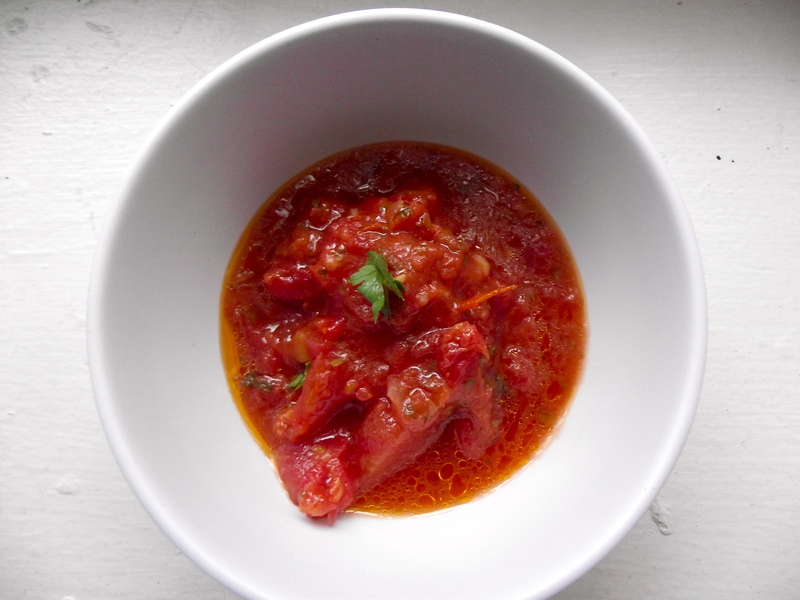 I just love the richness of the sauce you can’t get from canned tomatoes. I use Trader Joe’s bruchetta called “Trader Giotto’s”. YUM on a piece of toasted french bread and especially in this sauce. Say no more, be still my heart.